First published in 1992, this book explores how we come to hold our present attitudes towards health, sickness and the medical profession. Roy Porter argues that the outlook of the age of Enlightenment was crucially important in the creation of modern thinking about disease, doctors and society. To illustrate this viewpoint, he focuses on Thomas Beddoes, a prominent doctor of the eighteenth century and examines his challenging, pugnacious, radical and often amusing views on a wide range of issues concerning the place of illness and medicine in society. Many modern debates in medicine continue to echo the topics which Beddoes himself discussed in his ever-trenchant and provocative manner. 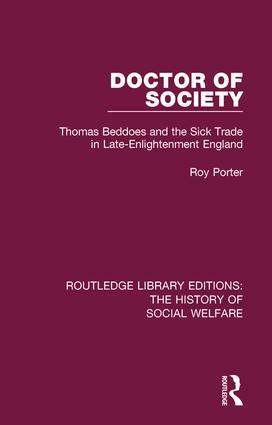 This book will be of interest to those studying the history of medicine, social history and the Enlightenment.